Alan Siegrist, a professional Japanese-English translator, member of both Japan Association of Translators (JAT) and American Translators Association (ATA), has finally solved the mystery of gibberish “Asian Font”. Obviously the characters themselves might be correct and have meanings in both Chinese and Japanese. 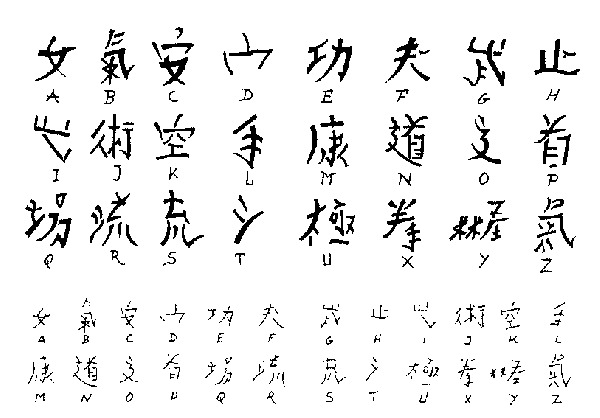 However, the characters have nothing to do with the English alphabet, yet many tattoo shops consider this template as a valid translation tool, and using it to translate English names and words into Chinese and Japanese. "There are no equivalents for the letters V and W. 充 This looks like the right side of 流, but 充 is the closest full character I can find. 戈 This looks like the radical in the top-right of 武. 辶 This looks like the radical in the bottom-left of 道. * The character for "Y" is a mystery, looking something like 米米産 as one character. 流(R) = 氵(T) + 充(S) "
We have also found an actual website that is still currently selling this gibberish "Asian font" along with some other designs for $64.99. Wow. Spectacularly dreadful - it's hard to imagine someone (like the Finnish racist) thinking that to translate something into Chinese, all you need to do is change fonts. Even the concept of transliterating is way wrong in this case. I guess believing in this font is its own punishment. This makes the tattoo immediately below this entry all the more cringe-inducing. Knowing what the S and O were intended to look like- wow. Congratulations on coming up with this font listing! I can't believe they sell such 糞　!!! Guess what? Kim Maher's tattoo is this font as well. It's up to the customer getting the ink to do the proper research not the artist. Anyway, a friend showed me her brand new tattoo, saying Orši (short for Orsolya, Hungarian female name). "Saying" Orši. I immediatelly told her it's gibberish, and she didn't believe me, because she didn't know I used to study Chinese. Then I told her I will prove it to her, and googled for "hanzi+misuse". First website to come out was yours and it was indeed the best one I could stumble upon. I have to wonder if the person who originally started pushing this did it intentionally as a scam, or whether it was honest stupidity. How the heck did anyone come up with this supposed font? Moreover, the hanzi designs on that website are all over the place...my elementary school teacher would have a field day with the penmanship. The kanji tattoo fad brought lots of people into tat parlors, many of them asking to have their name or the name or initials of a lover tattooed on them "in kanji." Tattoo "artists" naturally want to please their customers and find a way to do this quickly and cheaply before their customers reconsider. People knowledgeable about Chinese and Japanese of course know that there is no Chinese "alphabet" for such a quick-and-dirty way to write names or initials without a lot of research, which would force the customers to go home and think about getting their tattoo (and probably losing the sale). So the only person who could come up with such a bogus "alphabet" (for which there is obvious yet misguided demand) would be someone utterly ignorant of Chinese and consequently has the horrid penmanship we see. This explains a lot. I had always wondered why so many of these tattoos had such awful calligraphy, and yet so many of them looked so similar. That must be one of the stupides things I have ever seen in my life. "Here are some wonderful Chinese/Kanji & Egyptian Flash Design Sheets which are very popular and a must for any modern tattoo parlor." O God... this is so sad, and quite expensive too!! I was in a shop the other day and the cashier had a chinese character on his forearm. I asked if he knew what his tattoo said. He said, "They TOLD ME it means 'together'." The character was written correctly, but it actually meant "connect." I had to restrain myself from jumping across the counter to smack him upside his stupid head. Yes, I think dread is the operative word, as in dreadful. But it is a bit interesting to check the archives, because I see some themes developing. For example, we can now read a few people's names, among them Jason, Joe, Sofi, Mike, Paul and Cuneyt, which appears to be a Turkish given name. Continuing on the Turkish theme, I think Prenses means "Princess" in Turkish. It's a bit unclear why someone decided to tattoo themself with the word dough, though. Some rather mundane initials include Marquis Antoine Daniels' MAD, along with CT, NCU, XLG, SCK, ZHM and there was evidently even a doting father that decided to tattoo his child's initials LJR onto himself. Awww. I am guessing that this mess was supposed to be two lovers' initials "MN x CK" but wouldn't it have been better carved in a tree somewhere? I wonder if it'd do any good to contact the sellers of this absurdity. The website selling it also claims some sort of copyright over it, but I kind of doubt it. I guess the odds of them doing something (like dropping the "alphabet" from their products) are pretty close to nil, however. I read about this site on CNN.com and I must say that I'm impressed! I'm Chinese but my Mandarin's really not that great though I can read Hanzi...pretty badly! Anyway, this post reminded me of one time when I was walking around Covent Garden in London with a friend (from HK) and we stopped along a roadside stall that offers semi-permanent tattoos. We glanced at the sheet displaying what they could do and OMG...it was a photocopied sheet of paper with individual characters and meanings below the characters. the translation was spot on BUT...I think that there must have been a mistake when they photocopied the sheet without the translation cos (brace yourself for this)...the words were reversed i.e. mirror image of the original AND upside down!!! we burst out in giggles and ran off. oh crap...sorry it wasn't CNN.com...can't recall the site. I was expecting the font to at least use characters for words that start with the sound of an English letter. For example, using the character for Tao to represent the letter T (or D). Apparently this font doesn't even do that? I was expecting the font to at least use characters for words that start with the sound of an English letter. [snip] Apparently this font doesn't even do that? Only then it'd be further complicated by Kanji. For example, 安, which is the letter "c" here, would be a good option for the letter "a," but apparently, it can be pronounced with an initial "y" in Japanese? So that could be confusing. OTOH, "爱"(pardon my simplified) could be used for the letter "a" either way. Personally, I'm not so sure this was an intentional hoax or anything. It's also possible that this is just one of (many) asian font sets made just because there's a font set for everything out there. So maybe it was made for fun and is just widely used in ignorance? Of course, it'd still take an incredibly special person to believe that Chinese was just a character cypher of English! And now for the obligatory story: I once knew a girl who downloaded a Japanese katakana font set and put it on t-shirts that she then sold for her senior project. She insisted to the end that ヤメネモ was her school's initials. That's too politically correct. A person that believes something like that is naive or just plain stupid. Oh my! This is getting interesting. FYI, Prenses really means princess in Turkish. Reminds me of some guy who wanted his girlfriend's name written in Japanese and did not like the Katakana or Kanji and took the Hiragana transliteration. This font is like an epidemic spreading. I've seen even worse ones. When I went to Myrtle Beach last spring, I saw an "alphabet" consisting of fucked up hanzi, katakana, and archaic hiragana (ゐ、ゑ) I...really wanted to strangle the person who created it. Wow, this is a very interesting thread... it would be interesting to research the origin of this font itself. It looks like it just caught on like wildfire and everyone erroneously believed it to be true over the years. A sort of assumed romaji table or something. Just imagine the waves this could make in the tattooing industry as the truth becomes more widespread. it would be interesting to research the origin of this font itself. I thought so too. Some tantalizing clues to its origin can be found in the characters in the font themselves. 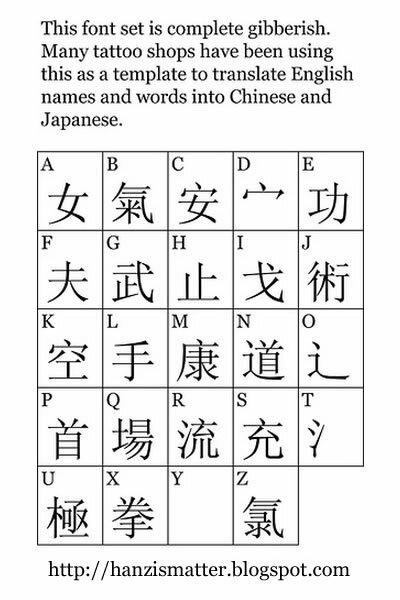 It is quite telling that the person who created the font evidently could not find 26 Chinese characters lying around, so they had to break some of the characters they found into two parts to fill out the alphabet. Clearly the author of the font or tattoo flash was working from extremely limited resources. So the creator of the font may have had some sort of interest in the martial arts. The characters may have been lifted from some sort of literature that gave the names of some of the arts in Chinese characters. I think several of the terms above are used mainly in Japanese and not in Chinese in these senses. So I am guessing that it must have been some sort of Chinese-illiterate martial arts yahoo who dabbles in slinging ink on the side. 戈 is radical 62 in Chinese, means a spear. 辶 is radical 162, means walking... and sometimes seems to have 1 dot and sometimes 2. Don't know why. Still can't work out where they all came from though... Could it be one of those keyboards designed for Chinese input that has a character mode and a roman mode, with both sets printed on the keys? There are futhark transliteration tables, and ones for various Tolkien scripts, that have been around for decades at least. People use them to a) write messages to each other that /appear/ to be in a foreign language, but are not - a substitution cypher that is not readily apparent as such - and b) to make "background" or "decorative" text in art or interior design. Most frequently both the above purposes are evident; there are innumerable fantasy-epic type paintings and drawings that include "secret messages" that are english converted to pseudo-futhark or "tolkienish" for insiders to decipher. This may be something that started out with the same purpose - the (mis)appropriation of asian characters for artistic cryptography - which then somehow escaped into the wild. On that note, "writing your name in Egyptian" is really the same deal. Myrtle Beach is such a trashy tourist trap. (I was there on a Habitat for Humanity volunteer trip, not as a tourist!) Some girls in our group went to get "henna" tattoos. Among the flash that was at that stall was a list of Chinese words with English translations underneath. Some were ok, but the one that said "jiu" was translated as "strength". "Clearly the author of the font or tattoo flash was working from extremely limited resources." "On that note, "writing your name in Egyptian" is really the same deal." Well, actually, not if done correctly. There are some hieroglyphic characters with single-consonant, vowel or syllable meaning. But with "ancient egyptian" being a "semitic" language (like arabic and jewish), not all "usual" english consonants and definitely not all vowels can be expressed. I just found your site and I have to say I've seen a lot of these fake Asian font characters all over the place. I have a... picture with the same character as the one here for the letter C hanging on my wall (I got it from an ex-girlfriend) with Serenity written under it. So, it's not just tattoo shops, they're everywhere. While I can neither read nor speak Chinese, a week spent on a business trip to Taiwan trained me to recognize a few vitally important characters. Specifically, I know that the character that supposedly represents "A" is actually the one used to designate a women's restroom. The character 女 is used because it literally means woman/female. You can thank the Spaulding & Rogers tattoo company for this atrocity. They originally sold these flash sheets to tattoo shops in the mid-late 80's. They probably paid the guy who delivered their chinese food to draw them some symbols, and thus it was born. Being a tattoo artist, I'm sorry to say that I did a few of these before I knew better. The fad is probably wearing off a bit, but it's still funny as hell! Look at the middle row, read down the MIDDLE column. If you were to add an initial I first, then read down the row, then you've spelled what the person originally wanted as a tattoo. I'd never guessed that an IDIOT is the origin to an original but nonexistant alphabet made to look like characters! 戈 (ge1)isn't just a radical, it's a character in it's own right. Little used today, though, but pops up in expressions like 大動干戈. Using it like a letter is of course still silly, and it's even weirder to connect it with the letter i. It might be dumb but I'm still kinda proud of it. Thanks for solving the riddle, guys! Carlos Mencia Says "Get the Right Tattoo!"